I absolutely rely on it to look and feel good. Everything else is anchored and made effortless by my denim foundation. Denim, being universally stylish, can be paired with anything, dressed up or down and worn for almost any occasion at any time of year. It lasts forever, often getting better with age. Inarguably basic, yet oddly complex, denim is one of the few pieces in fashion that’s constantly evolving. All five denim basics can be used multiple ways. Regularly adding different denim pieces to your wardrobe is a great way to expand your options. For example, I own an oversized denim jacket, a fitted one, and a cropped one… for now. Besides my jeans, I wear my denim shirts the most. I wear them as is, thrown over a tee shirt or leave them open as a layering piece. A denim jacket is the ultimate piece to own. I don’t travel without mine. It’s functional, goes with everything, and is the perfect finishing piece to almost any look. I also wear it just as a top for a more structured denim shirt look. I own a couple of denim skirts, but this maxi is one of my favorites. It’s a no-brainer when I need something a little more than a pair of jeans. I reach for this easy denim dress all the time, especially when I’m in a bit of a rush. And I love that I can throw it on as a layering piece over a dress or pants, too. And as we all know, there are almost too many styles and shades to choose from when it comes to jeans – skinny, boyfriend, flared, boot-cut, distressed, etc. If you want to keep things simple, invest in a dark indigo pair of flared or skinny jeans. They are usually the most flattering and versatile jeans you can wear. So tailor your denim choices to your personality and individual style. It may take time to find the right fit for you, but don’t give up. There is a perfect jean for everyone. Once you find them, you won’t want to take them off. Oh, and buy more than one pair or color in the jeans that fit you. You don’t come across the ideal jean very often! Once you determine what denim styles suit you, putting an outfit together with denim is a snap. The mixing and matching is endless because denim is one of the most personal things you can wear. So “Don Your Denim” with confidence and let it be your cornerstone, your foundation, your wardrobe rock. Where you take it is up to you. What a perfect post about DENIM – a have one on my blog too 🙂 – your pictures are wonderful. The different possibilities of combining show how different DENIM can be combined. I’ll be getting more and more FAN of it. Hi Martina, so glad you love denim as much as I do, I’m obsessed and I have a feeling you will be soon too! 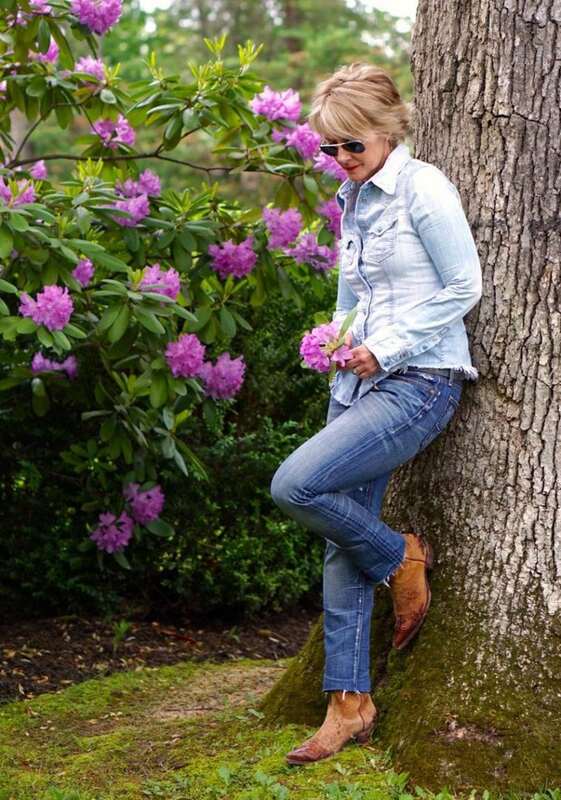 I work in a retail clothing shop that caters to mostly middle-age well-to-do women, and it surprises me how often a woman will say, “I’m too old for denim!” I always tell them that denim is an ageless American classic…it’s for all of us! It’s like you said: Find your fit and style and you’ve got it made! I hear the same thing so often as well and you are so right, it is ageless!! I think it actually makes you more youthful. 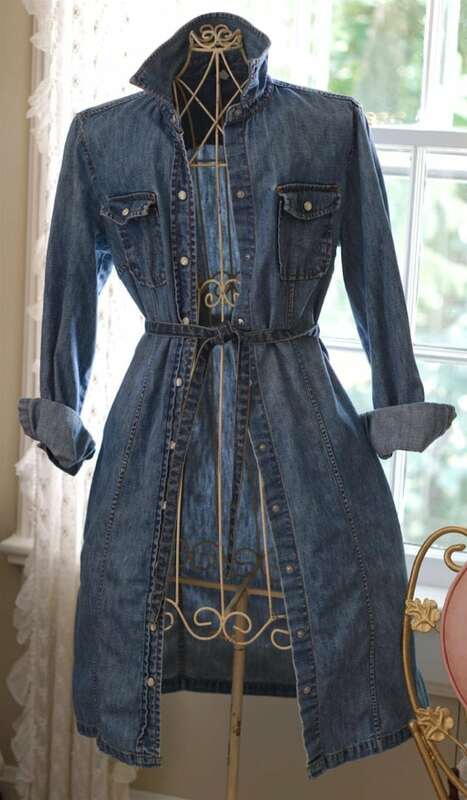 Brenda, you would look fabulous in denim. I know there is the perfect jacket and shirt out their with your name on them!! You can “throw together” an outfit, that’s for sure! Lovely! You are a sweetheart Barbara, thank you! I love my jeans. I tend to stick to dark wash, without any stress. My favourites are skinny or straight leg, but I also have a pair of skinny boot cuts. I find the boyfriend cut looks sloppy on me. Black and grey denim are a staple in my wardrobe, as well. I love slightly fitted jackets with a little detail. Collar popped, of course. I have a chambray shirt but it just hangs in my closet. Obviously not a fave. Try wearing your chambray shirt under a crew neck sweater or a blazer, I do both quite often and it just gives you a whole new look. Love black and grey as well Joanna! I own one pair of denim pants and one short crop jacket!!!!!! I doNOT wear short cropped jackets……………so it sits in the closet taking up DESPERATELY NEEDED SPACE! I cannot TOSS IT………don’t ask me why!!!!!! I love how you style it and YES THAT LONG SKIRT would be MY FAVORITE TOO!!! Beautiful Post by a BEAUTIFUL LADY! Contessa, you are a sweetie. I know that you could make that cropped jacket work, and that long skirt would look fabulous on you! Great post! 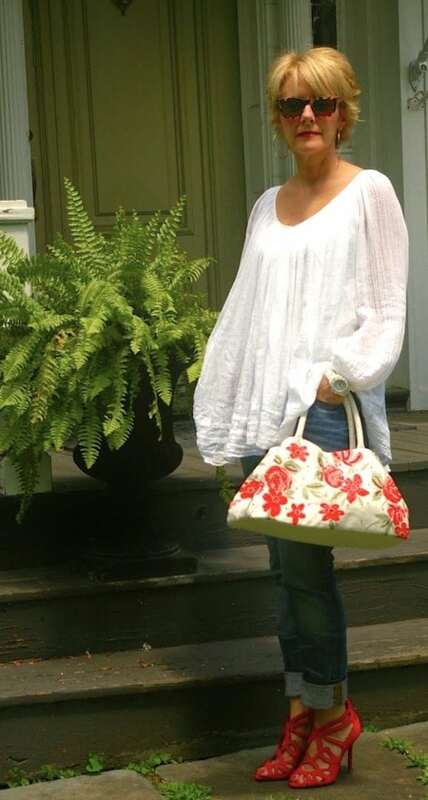 I love to mix it up with denim and pair it with unexpected pieces. That polka dot skirt is fabulous! Isn’t it great to pair with everything, it’s just so versatile I can’t get enough. Thank you Fancypants- love that! Oh my goodness what a great post! You’ve totally opened my mind to ways I can incorporate denim! Your outfits are beautiful! I love your fashion style and that denim shirt and long polka dot skirt! I am flattered that you like my fashion style, thank you Robin!